Panda Express wanted to make a statement that would differentiate the brand's version of the dish from competitors' and establish a narrative that could be sustained throughout a five-month campaign. Panda Express leveraged its Chinese-American heritage to celebrate the launch of its General Tso's Chicken dish. As part of its campaign, Panda Express created an innovative physical activation and event series, along with other digital and social content. Planning for the campaign began in the fourth quarter of 2015. Panda Express sought to make a statement that would differentiate the brand's version of the dish from competitors’ and also establish a narrative that could be sustained throughout the five-month campaign. "For us, a main goal was that we wanted to authentically claim the Chinese origins of our founders and celebrate the Chinese-American cuisine that Panda has helped define for the past 33 years," explained Dave Wallinga, VP of guest relations at Panda Express. 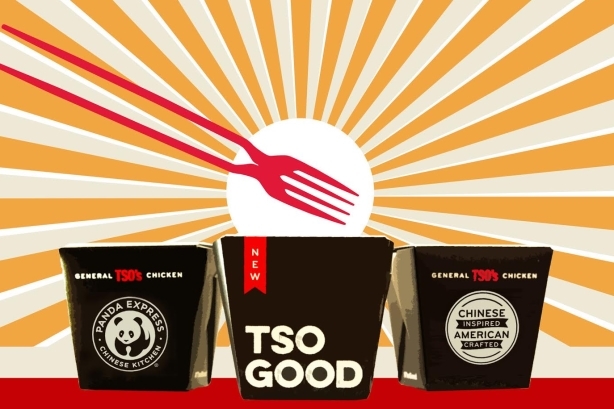 "With that as a goal, we asked ourselves what dish would support that messaging we wanted to tell consumers and General Tso's became that opportunity for us based on its history." A major aim of PR efforts was to celebrate Panda Express' heritage and how its variation of General Tso’s Chicken embodies the idea of Chinese-inspired and American crafted food. Thus, the "American Original" tagline for the campaign was born. Havas Formula’s strategy was to take an integrated approach, inclusive of PR, social media, and a physical activation, to ignite a broader conversation around Chinese-American food culture. "Our primary targets were [ethnic and Caucasian] millennials," said Wallinga. "People drawn to our brand tend to be people who have an interest in other cultures and are interested in exploring culture through food, so that becomes a psychographic group who our brand really resonates with." Panda Express created a new eating utensil for the campaign called a "chork," which is a chopstick-fork hybrid. On August 6, Havas Formula’s experiential arm, Havas Street, installed a 15-foot takeout container and matching 22-foot chopsticks outside the Glendale Galleria shopping mall in Southern California, home of the first Panda Express restaurant in 1983. Brand ambassadors on-site distributed "chorks" and invited passersby to the unveiling ceremony of the new dish. On August 10, Panda Express fueled online buzz with its first Facebook Live broadcast, during which hosts chef Adrian Lok and lifestyle blogger Lily Martinez engaged audiences in the moments leading up to the big reveal. A sweepstakes accompanied the live stream, where viewers could guess what the new dish was going to be and win gift cards for participating. The team also bolstered awareness by posting content across social platforms, encouraging fans to interact with the brand using the dedicated hashtag #TsoGood. The PR team invited media attendees to a launch event for a preview of the product and conducted media outreach to generate top-tier coverage in outlets ranging from Bloomberg and Eater LA to Nation’s Restaurant News. On August 10, the takeout container was opened to reveal the new dish via a sampling bar and artwork by Los Angeles-based Asian-American artist Steven Wong. In addition, the launch event included a photo booth utilizing green screen technology that allowed consumers to take a picture inside a General Tso’s Chicken takeout box. On August 20, Panda Express held an evening-long series of events at Chinatown Summer Nights, an annual summer food party series that takes place in Chinatown, Los Angeles. To begin the night, the campaign team partnered with agency 10 Story House to coordinate a media panel celebrating the significance of American Chinese food. The panel was titled, "Beyond the (Takeout) Box: The Culture, Community, and Comfort behind American Chinese Food." The discussion was moderated by Jennifer 8. Lee, journalist and producer of the documentary The Search for General Tso, and featured Panda Express CMO Andrea Cherng; author of American Born Chinese, Gene Luen Yang; Alvin Huang, founder of Synthesis Design + Architecture; TV and film producer Melvin Mar; and CNN host Lisa Ling. After the panel, a group of celebrity chefs participated in a cooking demo featuring regional varieties of General Tso's chicken. Havas Formula secured media interest in the event, landing coverage on NBC Los Angeles and We Like L.A. Chefs involved in the demo included Jimmy Wang, Panda Express director of culinary innovation; Charles Olalia of Rice Bar, Patina, and Ritz Carlton; Perry Cheung of Phorage and The Slanted Door; Isa Fabro of Amboy, Unit120. and Orsa & Winston; and Chris Oh of Seoul Sausage, Hanjip, and Escala. The campaign team also developed further content with the influencers featured in the Chinatown Summer Nights discussion. Panda Express, with help from agency Shark Pig, created an "American Chinese Origin(ality)" video featuring the panelists. In addition to the video, Sonnenberg and Associates developed an interactive website that includes content produced with the panelists. Thus far, the campaign has generated more than 609 million media impressions, measured across both social and traditional outlets. Media outreach efforts landed 201 placements in outlets including: Good Morning America, Time, Business Insider, Food & Wine, NBC, Los Angeles Times, Travel + Leisure, GQ, New York Daily News, CNET, FOX News, Thrillist, and Eater LA. While at the reveal event, Lisa Jennings, West Coast bureau chief for Nation’s Restaurant News, tweeted about the chork and the story spread to other outlets. The team pitched the chork story to secure coverage in outlets such as Good Morning America, where anchors tasted General Tso’s on-air, Time, Delish, Eater, Thrillist, and Grub Street, among others. Overall, more than 150 media placement features incorporated the chork. The "American Chinese Origin(ality)" video has received more than 1 million views on YouTube. The Facebook Live stream of the launch event received more than 22,000 broadcast views.